Earl took control of his last flight and flew his plane into the twinkling morning sky. He was a man who loved his wife, his children, airplanes, boats, fishing poles, dogs and causes. Some people will remember Earl for his “Letters to the Editor”. However, he was so much more than opinionated. His hobbies were extensive, putting his heart, soul and mind into whatever he created. For most of his life, fishing was always a priority, be it ocean, stream or lake. 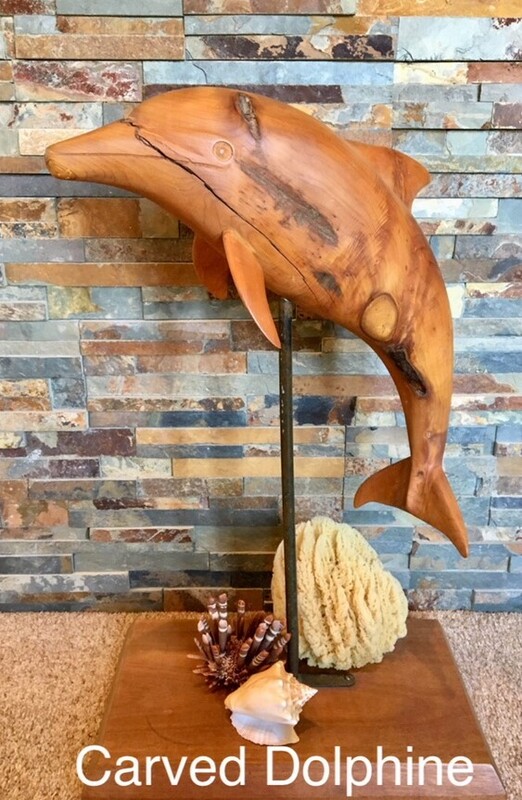 Other hobbies included photography in the late 40’s early 50’s, turning a garage into a family room in the early 60’s as well as refurbishing sports cars. 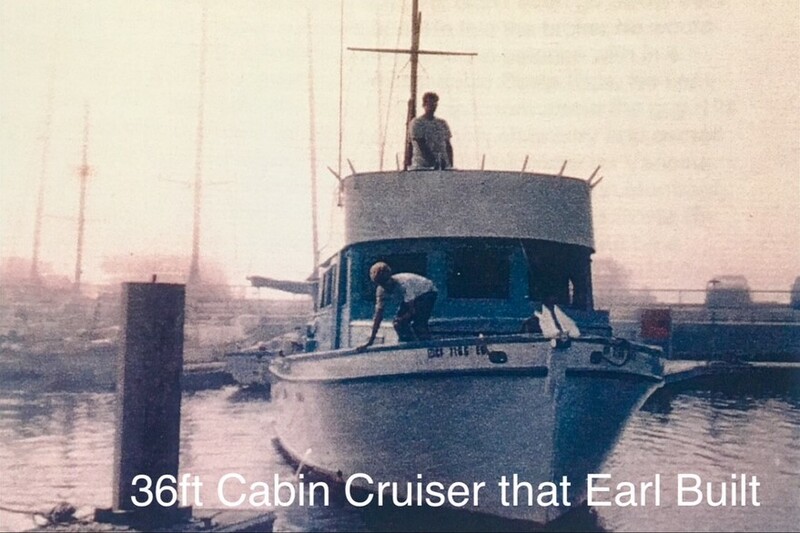 In the late 60’s-early 70’s, Earl built probably his “largest” achievement, a 36 foot cabin cruiser, the Eileen Ann, named for his wife. 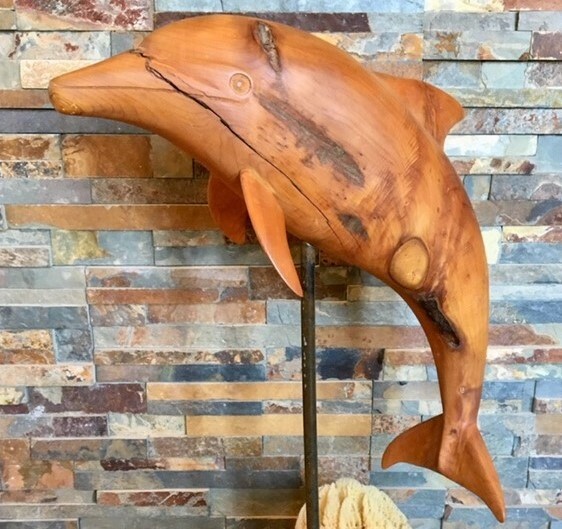 As the 70’s moved on, Earl moved onto woodcarving and creating Dulcimers. 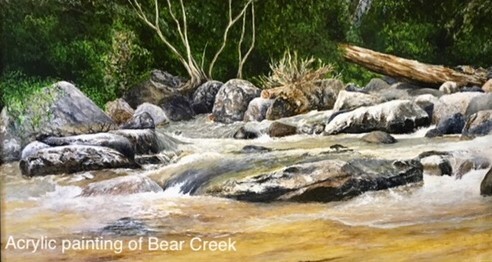 In the 80’s he taught himself how to paint with acrylics and created beautiful paintings of Bitterroot and Montana scenery that continued into the early years of this century. Earl Jr. was born on August 12, 1924 to Vera and Earl Pollard Sr. They lived in El Monte, California. Earl Sr. was a salesman for the Graves Window Sash and Balance Company. Vera was an enterprising woman who, among other things, baked cookies for Laura Scudder (of the potato chip fame), grew Boysenberries for Knot’s Berry Farm and raised hundreds of rabbits for the meat and coats. Aside from picking berries and cleaning rabbits, Earl grew up hanging out with his Step-Grandfather, Francis Alvarez who, as a retired LA Fire Chief, owned the largest Mortuary in Los Angeles. Earl’s Grandmother Clara, was an Eastern Star Officer and a member of the D.A.R.. Earl’s ancestors fought in the Revolutionary War in exchange for land in Tennessee. These were the grandparents on Earl’s Mother’s side. On his Father’s side was his grandfather Ruben Pollard and his Grandmother May, who was supposedly part Cherokee Indian. Earl had little interaction with his paternal Grandparents. However, Earl claimed his Cherokee heritage all his life. Fortunately, science caught up to his claims, and through DNA testing he was indeed, able to prove his Cherokee heritage. Upon graduating from El Monte High School in 1942 Earl signed up with the Navy to become a Navy Aviator Reservist. In March 1943, he reported for Navy Flight Aviation School on the University of Southern California campus for 6 weeks of book learning. Then transferred to Holbrook, Arizona where he learned to fly. Followed by a transfer to Monterey, California, to complete his flight school training. 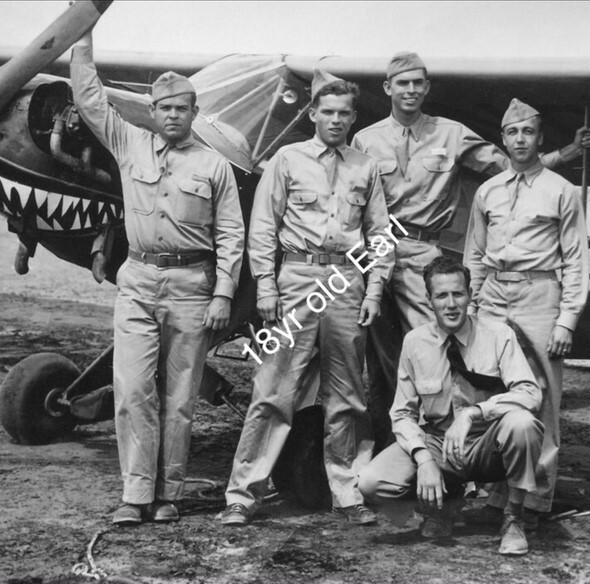 In Monterey, Earl received orders to go to Norman, Oklahoma to attend Primary Flight School. Earl’s classification was Aviator/Navigator. In Norman he flew a N2S Stearman biplane. With winter approaching, Earl would donn his fleece lined leather pants, jacket, gloves, helmet with goggles and boarded his open cockpit Stearman for training. He loved the classes on aerobatics with the rolls, loops, spins, Immelmann turns and the Falling Leaf. After checking out on the aerobatics, Earl moved on to a Tim T-1 formation trainer. No aerobatics for that plane. Level flying only, but fast. While in Norman, Earl met the love of his life, Eileen. Eileen, as a part of a group of young ladies and a chaperone, would take a bus to the Naval Base in Norman to attend dances. When 19 year old Earl saw 17 year Eileen, he fell head over heels in love. Like Earl, she too was from the Los Angeles area of Southern California. Because of the war, Eileen’s father was transferred from the CA Douglas Aircraft Manufacturing plant to the Oklahoma City facility. 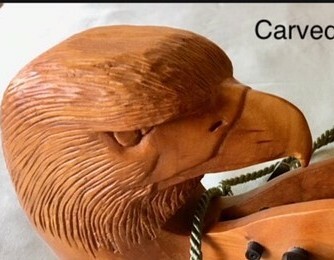 Every time Earl had liberty, he would take Eileen out on a date. He would show up for these dates with a bouquet of flowers for Eileen’s mother Clarice, booze for her father John, and a box of candy for Eileen as well as a silver charm for her charm bracelet. On one bleak night Earl did not show up for their date. Eileen was devastated. Unfortunately, Earl had succumbed to the Scarlet Fever outbreak on the Base. It was a couple weeks before he was able to communicate with Eileen and explain what happened. Those few weeks of feeling great sadness vanished the instant Eileen heard Earl’s voice on the telephone. She was relieved to know he still loved her. By this time Earl was facing a transfer to Corpus Christie, Texas, for Basic Training School. Earl and Eileen maintained their relationship through daily letters until Earl finished school and was transferred to Shawnee, Oklahoma. For Earl, Shawnee was heaven because he was only an hour away from Eileen. 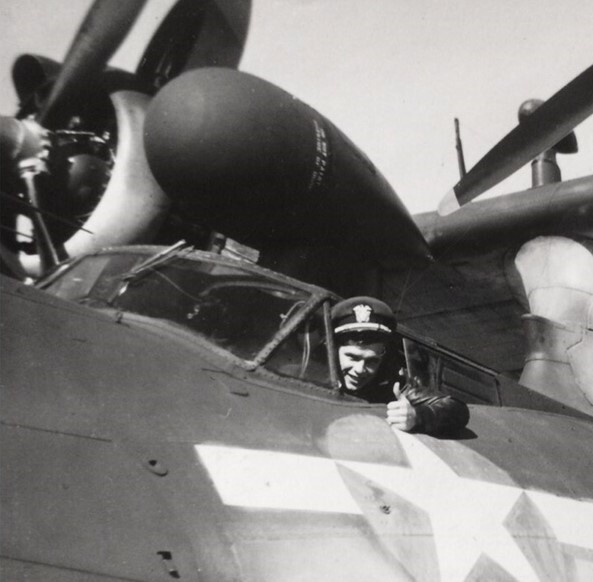 Earl was now a qualified four operations: pilot of fighters, attack, flying boats and land based bombers. It wasn’t long before he was sent back to the West Coast, anticipating orders for the Asia-Pacific Front. Eventually Earl was stationed at Oak Harbor, Whidbey Island, Washington. There he learned to fly a PBY-5A, with the ultimate goal of a trans Pacific flight to an Island off Japan. While waiting for orders, Earl and his crew flew an anti-sub watch along the West Coast. Eileen was always on Earl’s mind since the night he met her. Being engaged was not enough for those two. Earl at 20 years old, Eileen at 18, and with their parents written permission, were married in a base chapel in Oak Harbor on April 1,1945, Easter Sunday. This year, April 1, Easter Sunday, Eileen and Earl celebrated their 73rd wedding anniversary. As newlyweds during the war, they spent their first few months together moving from one farmhouse apartment to another. As the end of the war drew close, the Navy was thinning out its pilots, separating Reservists from active duty. Earl understood it was easier to return to civilian life if he separated from the Navy sooner than later. In late 1945, Earl was honorably discharged to civilian life. Earl and Eileen retuned to Southern California and rented a small apartment in El Monte. Life after the war was a challenge. Competition for jobs was high. After a few years of job hopping, Earl became a Field Technical Rep with North American Aviation. By this time he and Eileen had two children, Cathy born in 1947, and Carol born in 1950. At one point, he and Eileen and their children moved 22 times in 24 months for his job. Earl’s job was to climb into jet engines to inspect them, and then stand outside to listen with no ear protection. After a few years, the moving got old and Earl and Eileen bought a home in Redondo Beach. Earl got a desk job with North American. During that time Earl was involved with the development of cruise missiles for the Air force. Earl and Eileen had their 3rd child, Larry, born in1956, on the Fourth on July. 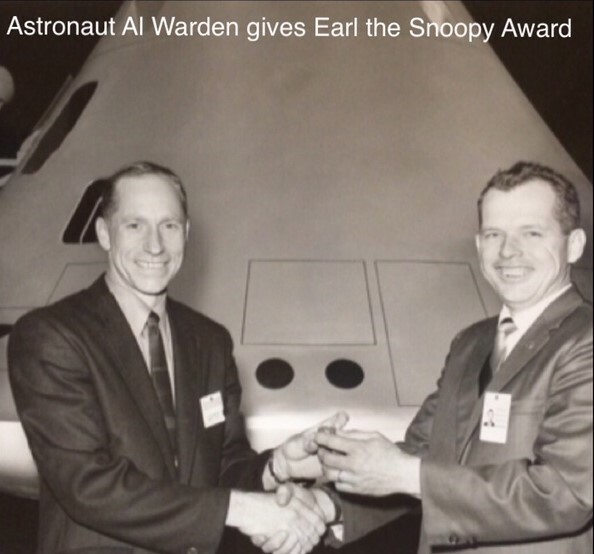 In 1961 Earl transferred to the NASA Apollo Program, contracted by North American. 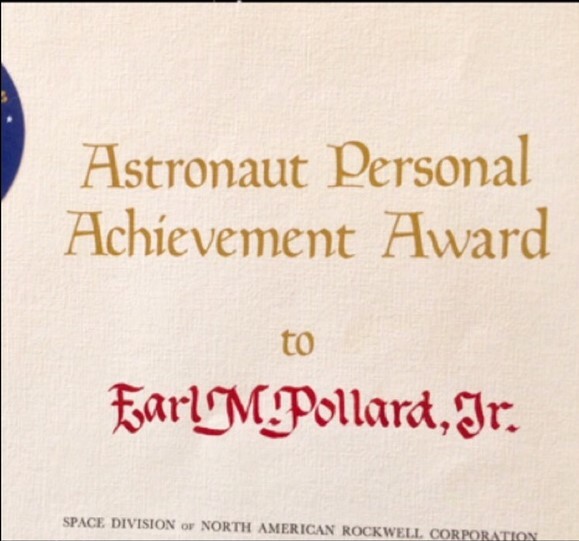 Earl’s job was to write the logistics and astronaut sections of the training manual. All top secret. Sworn to secrecy, he would come home, have a cocktail with Eileen, and to Eileen’s dismay, never said a word about his day. 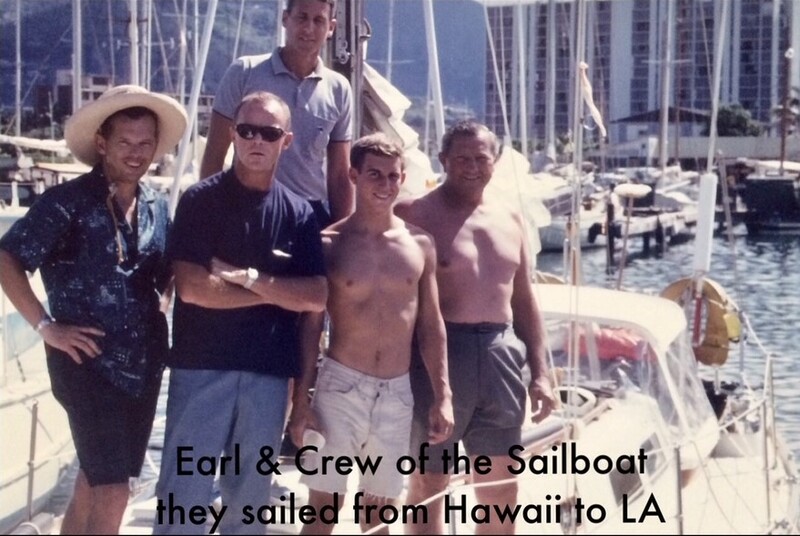 Earl often entertained visiting Astronauts by taking them sailing on his 29ft Columbia Defender, and later motoring on the Eileen Ann cabin cruiser to Avalon on Catalina Island off the coast of Los Angeles. Earl amassed a great collection of memorabilia from his years working on the Apollo program, and then the Shuttle program. He received awards, letters and photographs and would promptly store them only to be discovered by his children upon his death. In 1967, Earl took a month off from work and embarked upon one of his biggest adventures. He joined a crew of 5 men and sailed a 36ft. sloop from Hawaii to Los Angeles. In 1979, Earl retired from his job of 30 years working for the same company. He also retired from the Navy Reserves, which he had joined in 1949. Earl became a Navy Commander during that time. Earl and Eileen promptly moved to the Bitterroot Valley and built their home on 20 acres along Blodgett Creek. They had purchased the land in 1972 while on a vacation to the Valley. Why the Bitterroot? In 1966, the family drove to the Bitterroot to pick up the eldest daughter, Cathy. She had been staying with her finance’s parents, the Engel’s at their place in Victor. The entire family fell in love with the Bitterroot. Eventually, they would all move here. Earl enjoyed all that the Bitterroot and Montana has to offer with clean air, blue skies, good fishing, and vegetable gardens. Earl and Eileen spent many summers camping at Trout Creek and fishing the Noxon reservoir for bass. Aside from his painting, he built and flew motorized model airplanes. Earl was noted for his support of the ICARE movement to prevent the expansion of the Hamilton Airport to accommodate large aircraft. As the years moved on towards his 90th birthday, Earl phased out his ‘Letters to the Editor’. He enjoyed these last several years gardening and reading and watching the Blue Bloods TV series. A note of sincere appreciation. Earl and Eileen frequented a couple establishments in their later years. To River Rising and the early coffee clutch. Thank you. To Spice of Life and the caring and loving lunchtime crew we have nothing less than love, friendship, and memories. D.J., went above and beyond to transport Eileen and Earl to lunch, when neither of them could drive. Ellen would drop by for a visit and bring them a container of Spice’s soup of the day. To the Remington: Earl fell in love with his home at the Remington and the staff. They treated Earl with total respect and gentle loving care through his last breath and more. To Dr. Kathleen Harder-Brower: The family can’t thank you enough for the years of excellent loving care of Earl. He valued your honesty and your friendship. To Marcus Daly Hospice: Thank you for rapidly putting into place Earl’s needs, and helping him to make a comfortable transition to end of life. Many Thanks to Tom Grymes and his team at Daly-Leach for their gentle and kind assistance. Per Earl’s request, there will be no service. Additional photographs can be viewed in the Obituary section on the Daly-Leach website.